I am in Houston this week at the amazing annual expo of the American Association of Museums. Among the wealth of technical exhibits -- such as lighting, display hardware and catalog printing -- there are fascinating booths sponsored by companies that create replicas of our primitive ancestors, life-sized dinosaur skeletons and exotic mammals. What an eyeful! A striking carved and etched dancer (from an original image by famed photographer Lois Greenfield) glows in changing day-to-night LED colors at the Clay Center for the Arts and Sciences in Charleston, WV. We created a combination Donor Recognition-Art Glass mural in the theater lobby. 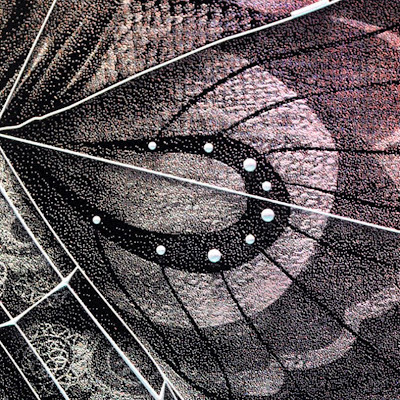 The design also features a "diamond necklace" of fractals trailing across the crystal panels -- a visual reference to the children’s discovery museum attached to the theater. I'm proud to say that this installation was the winner of a Creativity 35 Award of Distinction! 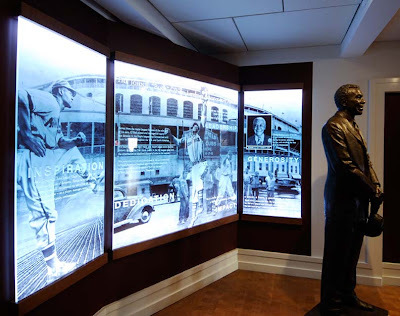 We also used dramatic photography in this National Baseball Hall of Fame Tribute to the great Buck O’Neil, a player, scout and coach who paved the way for African-Americans in major league baseball. O’Neil was known as a consummate gentleman both on and off the field. It was a special treat to select vintage photos of him -- and of the ballpark he called home -- and render them in etched crystal. 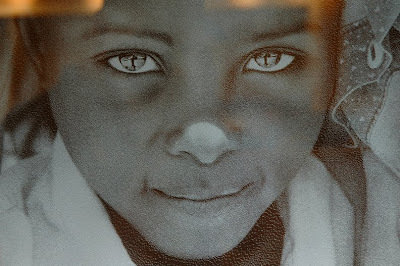 We use a proprietary technique to develop and convert photographs into a fine DPI (dot per inch) etchable matrix that we then use to create permanent monument-style, highly readable and realistic 3-D images and portraits. 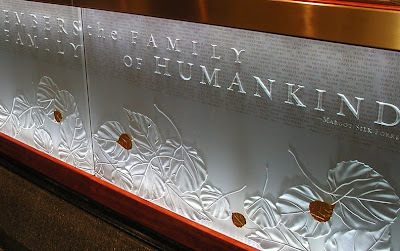 At St. Joseph Medical Center in Baltimore, we created a Heritage Wall that uses images and artifacts from the hospital's long history to create a permanent lobby exhibit of seven niches of carved and etched crystal. 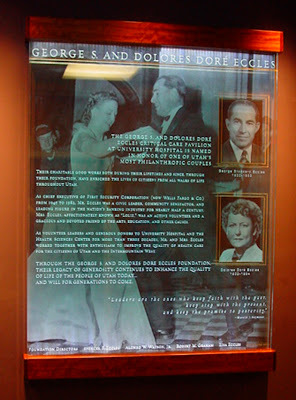 The panels not only celebrate the founding and growth of the hospital, they thank the institution's donors while serving as powerful branding and identity statements in the competitive Baltimore healthcare market. At the Museum of Fine Arts in St. Petersburg, FL, we were asked to create a Donor Recognition wall to serve as an eye-catching piece of art in their lobby. Because the museum is known for its dramatic collection of Steuben glass, we aimed to create an Art Glass piece that showed off the elegance and timelessness of deep V-cut carving in crystal. The crystal panels are edge-lit by strips of LEDs hidden in custom brackets at top and bottom. 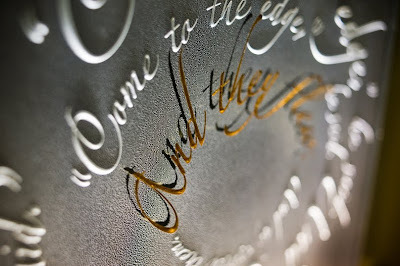 Crystal acts like a fiber optic, so when light is directed at the edge of a panel, it travels through the glass, highlighting the carving and making its message visible from quite a distance. Designing for museums is a fascinating process. 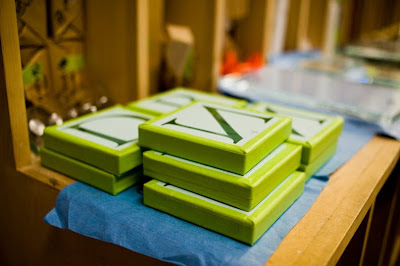 It gives us the chance to show our unique ability to create stunningly beautiful Art Glass that also serves practical purposes by providing information, identity statements and Donor Recognition. If you happen to be in the Houston area, MuseumExpo 2011 runs through the 25th. I hope you'll stop by booth 1604 and say hi! True art is created by the human hand. 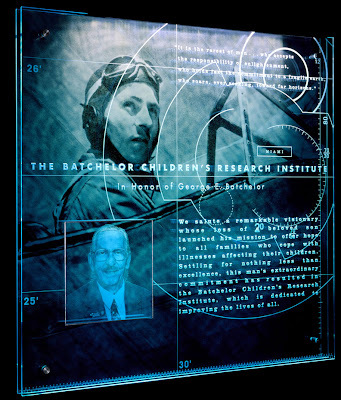 That’s why we use no machine carving, laser etching, or chemical processes to create the Art Glass Donor Walls, Tributes and Signage that we are famous for. 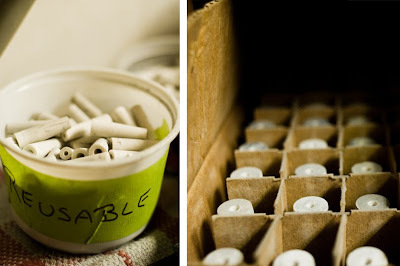 All of our award-winning pieces are meticulously carved and etched by hand. 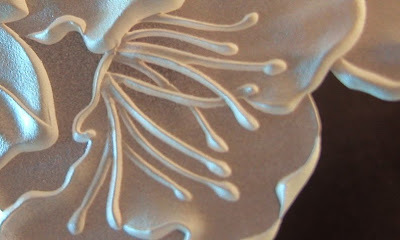 How do you carve and etch a material as delicate as glass? Ironically, it’s done by SANDBLASTING. Whether we are doing bas-relief carving to create the alabaster look of birds in flight or chisel-carving true V-cut letterforms (a monument-style technique once only possible in stone), the work is all done by directing narrow streams of air-propelled particles (originally, sand was used) to the back or front of thick sheets of crystal and glass. 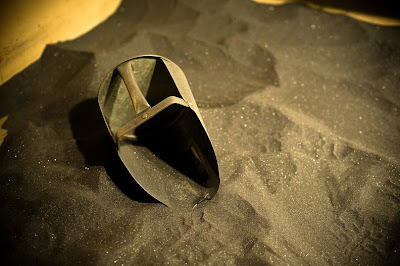 By altering the speed of the air, the size of the nozzle, the angle at which the nozzle is held, and how long the stream of “sand” is directed at a given area, a marvelous range of different effects can be created. Christina Wallach Amri began her career over 35 years ago in Paris, where she apprenticed with a fourth-generation family of glass artisans. 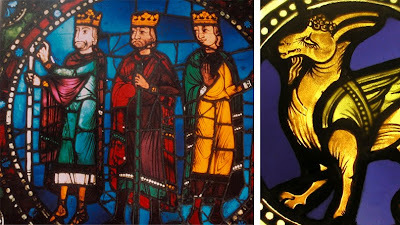 Among other projects, she worked on restoring the famous stained glass windows of Chartres cathedral. 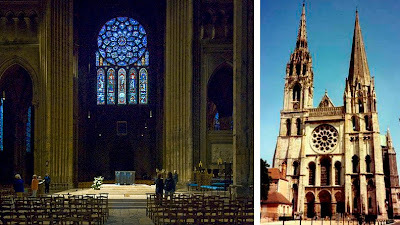 When Christina returned to the U.S. and founded Wallach Glass Studio (now Amri studio), she began developing techniques for etching and carving glass to resemble the timeless and elegant stone monuments she saw in Europe. She also brought her experience and studies as an art major at U.C. 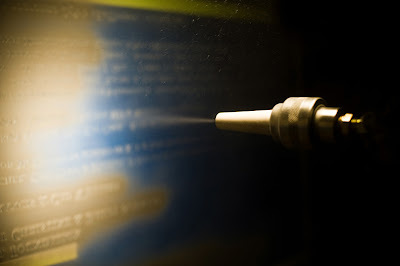 Berkeley into the sandblasting cabinet and began truly sculpting in glass. 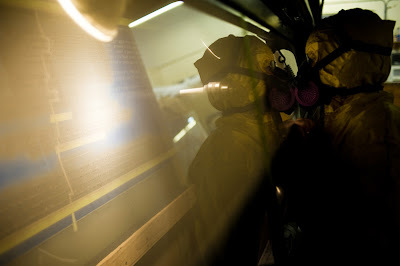 Now we are the deepest bas-relief glass carvers in the U.S., sometimes working on panels as thick as a full inch. 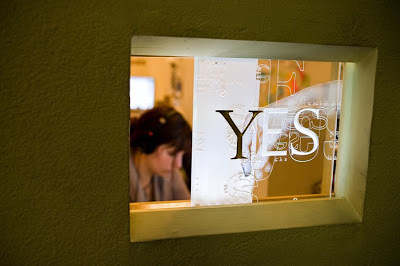 In the late 1990s, with the invention of sophisticated photo manipulation software, Amri Studio began working to find a way to increase the delicacy of its carved lettering and artwork and to etch highly detailed photo portraits in crystal and glass. The biggest hurdle to overcome was the fact that when converting a photo into dots, a process they call dithering, the image loses a lot of detail. We restore the fine details in a highly skillful, artistic and technical process we’ve developed that takes up to 20 hours per photo. When the resulting image is then carved into crystal or glass, each tiny dot is scooped out by a blast of “sand,” creating a tiny bowl shape. When the sandblasted image is edge-lit by LEDs, the little bowls collect the light as it travels through the crystal (which acts as a fiber optic) and the image looks dramatically three-dimensional. 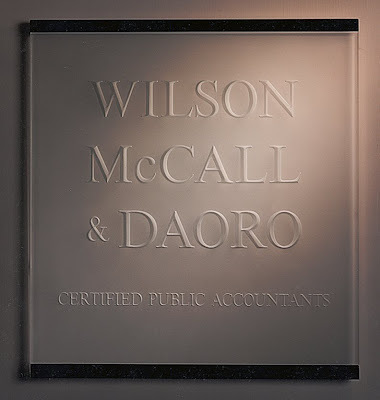 Thanks to the proprietary techniques we’ve developed for creating our signature chisel-cut, three-dimensional lettering and highly detailed photo portraits, our Art Glass panels -- whether they are Donor Recognition, Tributes or Corporate Signage -- brilliantly catch the light and read crisply at quite a distance with either ambient lighting, spot lighting and/or edge-mounted LEDs.